Golden artist Jesse Crock knows Colorado. An avid fan of climbing, cycling and the outdoors, his vibrant acrylic paintings and murals capture the rich colors of Colorado in a playful style. In Golden, Jesse’s artwork is depicted on several murals along Washington Ave., including on the north side of Mountain Toad Brewery, which also has his paintings on display inside. He was commissioned by the Eddyline Brewery out of Buena Vista to create artwork for some of their beer labels and his work was featured on posters for the Ouray Ice Climbing Festival as well as the FIBArk Kayaking Festival in Salida. Closer to home, Jesse’s artwork was depicted on the Golden Fine Arts Festival poster and the Golden Christmas ornament. Jesse enjoys getting the inspiration for his paintings from his travels through Colorado. He has completed a number of 14ers as well as biked the Colorado Trail in its entirety. 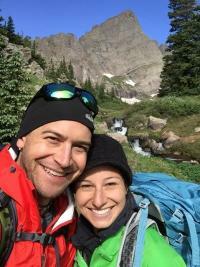 He enjoys getting out and climbing, either ice or rock, and enjoys many hours of hiking through Colorado’s wonderful outdoors. 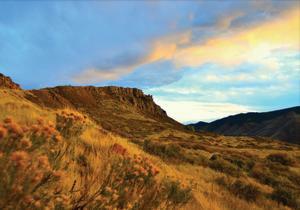 One benefit of living in Golden is that many of Jesse’s paintings are inspired from views from his own backyard. Jesse is a Golden native and graduated from Golden High School. He feels blessed to still call Golden home. 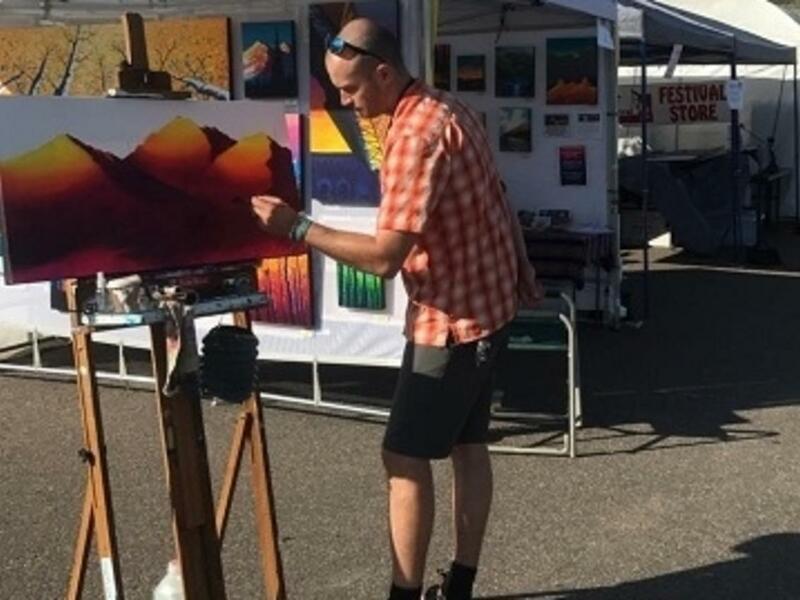 He works as an elementary art teacher in Jefferson County and when he’s not teaching, Jesse is usually doing one of his favorite activities, which often take place right here in Golden. Jesse describes his “Perfect Golden Day” as starting out with a single speed mountain bike ride up North Table Mountain, which allows him to take in the spectacular views as well as get in a good workout. Once home, Jesse likes to switch to his e-cargo bike and take his wife Lindsay out for a little brunch at either Sassafras, where he enjoys the Fried Green Tomato Breakfast, or at the Golden Diner, which he feels is home to amazing green chili. After brunch, the two usually head home to allow Jesse some studio time, where he can be working on anywhere from one to five paintings at a time. Jesse paints with acrylics, which he says allow him to create the vibrancy in his work. If time permits and a painting gets completed, Jesse goes to the Mountain Toad to display the new work. He enjoys seeing many familiar faces and the excellent beer at the Toad as well. Jesse and Lindsay often walk their Great Dane, Gigi, along Clear Creek and stop at the library. 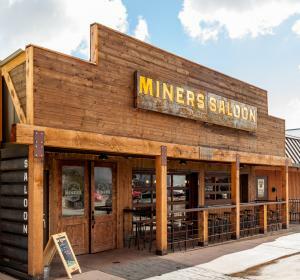 They also enjoy getting together with friends at local spots such as Miners Saloon or Golden Moon Speakeasy. Jesse enjoys the small town feel that Golden offers and appreciates the friendly connections everyone seems to have with one another. To finish his “perfect day” Jesse loves pizza from the Rolling Dough Pizza food truck, which is a Golden-based food truck and a regular at several Golden breweries. He specifically enjoys their Breakfast Pizza, which offers a freshly cracked, sunny side up egg as one of the toppings. After dinner, Jesse and Lindsay like to unwind from the day with a little campfire in their backyard.